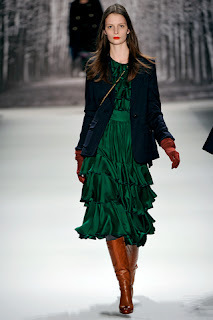 Milly by Michelle Smith debuted the labels Autumn/Winter 2011 collection towards the end of Mercedes Benz Fashion Week. Guests walked into the Stage venue and were greeted by a soft backdrop which looked like a cozy tree lined avenue fresh from a new snow. Keeping in theme, the first model stepped onto the runway as if she were strutting across the Upper East Side in a wool hat, knee high boots, leather gloves, and a sophisticated cape coat and pleated skirt; the cape coat featured slits at the arm which showed off the shape of the body as well as bright yellow flash of color to compliment the outfit as the model moved her arms. 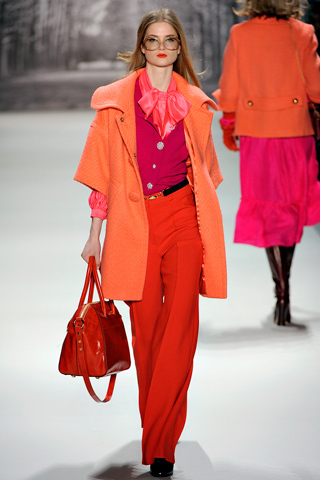 This season the Milly sophisticate is all about sherbet orange matched with reds, fuchsias, and other jewel tones including emerald green. One ensemble paired together sherbet orange, salmon, fuchsia, and red with black accents in a bright, sunny cohesive look against the grey and muted snow covered backdrop. The collection also featured black, camel, and mixes of charcoal and grey. Fluted skirts and pieces that move were at the core of the collection as many items featured subtle ruffles, long pleats, sheers, and even some lace which danced down the runway. 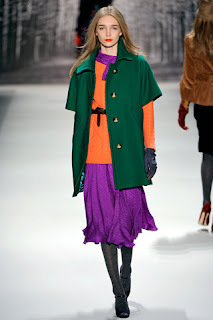 Adding to the lux color palate, Michelle Smith added in Mongolian lamb, tweed, corduroy, and plaid patterns to offset the delicate nature of the collection. In terms of cohesion, Mily’s Autumn/Winter collection was aspirational; it told the story of the ladies of the Upper East Side mixed in with retro undertones which kept it contemporary. Milly’s collection is not necessarily geared towards the Brahmin of New York; though it touches on the lifestyle of the most affluent neighborhood of the city, it is more reminiscent of Blair Walforf’s Olivia Palermo. From young adult to contemporary middle aged woman, the collection offered a lifestyle along with fresh, cheerful fashion for this upcoming winter. I love you, Tins, but your head is in all of my shots! Me too, very inspired as I do not typically wear much green!